Buckle up! We’re going to take a ride on a temperature roller coaster. Temperatures will gradually warm through Friday. By Friday, highs will be near 70 degrees. This warm-up will come to a screeching halt this weekend as a strong cold front hammers the ArkLaTex. This cold front will bring in a blast of very cold air and, perhaps, the coldest air we see all year. 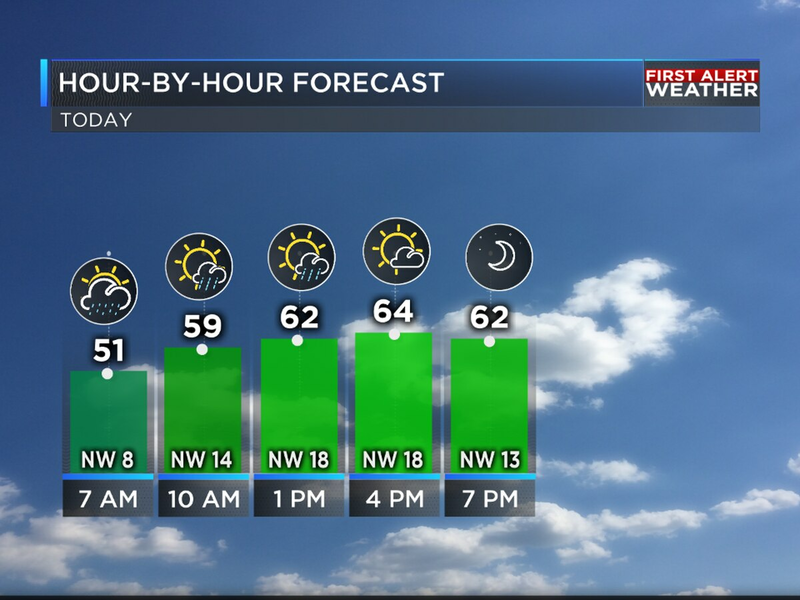 KSLA First Alert Meteorologist James Parish will explain why the high temperature of 58 degrees on Saturday is misleading and will track the cold blast hour-by-hour on FutureTrack in the video below. Much colder air will not be the only thing that will follow this front into the ArkLaTex. This front is also going to be a wind machine. Gusty northwest winds at 15-20 mph will follow the front. Wind gusts could be up to 30 mph Saturday afternoon through Saturday night. Sunday morning is going to be bitterly cold. Even though temperatures will tumble into the teens and 20s Sunday morning, it is going to feel even colder outside. A north wind at 10-15 mph will put wind chills in the teens area wide. Wind chill is the temperature it feels like when the wind hits your skin. Make sure to bundle up Sunday morning, especially if you are going to spend a lot of time outside. You’ll want to make sure to cover as much exposed skin as possible. A round of rain will impact the ArkLaTex before the cold air arrives. Widespread rain and a few storms will develop ahead of the strong cold front late Friday into Saturday morning. KSLA First Alert Meteorologist James Parish will track the wet weather on FutureTrack in the video below. Widespread rain will develop from northwest to southeast across the area Friday night into Saturday morning. Most of the rain will move out of the area by Saturday afternoon. The threat of widespread heavy rainfall and flooding is very low. Widespread flooding and flash flooding is not expected. Rainfall totals will likely range from 1-2″ of rain. A few places could see more than 2″ of rain. This much rain will likely not cause any additional major flooding problems, even though some rivers and lakes remain swollen. However, minor and localized flooding will be possible. The threat of severe weather is very low, but it’s not exactly zero. A small portion of E TX and points west will be under a Marginal Risk of severe weather late Friday into Friday night. A few strong storms capable of severe hail cannot be ruled out. Damaging winds and tornadoes are not expected at this time. The threat of severe weather will likely remain low due to a lack of instability or fuel in the atmosphere. The widespread rain will move out of the area by Saturday afternoon. However, we may not be done with the wet weather. Wrap around precipitation will be possible along and north of I-30 Saturday afternoon and evening. With colder air pouring into the ArkLaTex, there is the potential for snow to mix in with rain or for a transition to light snow. Right now, no major accumulations or travel problems are expected. Areas along and north of I-30 will have the best chance of a rain/snow mix or light snow Saturday afternoon and evening. Snowfall accumulations will be possible north of the ArkLaTex, though. Both the European and American (GFS) models show the heaviest snow falling north of ArkLaTex. However, the European model does show that a dusting of snow will be possible across the very northern tip of the ArkLaTex. Keep in mind, this front is still several days out. The forecast will likely change a little before it arrives.